Originally published: Feb. 7, 2014, 9:15 p.m. Updated: Feb. 8, 2014, 12:15 p.m.
East Mecklenburg senior Blake Brockington with other homecoming court members. Brockington raised $2,335.55 of a total $3,203.22. 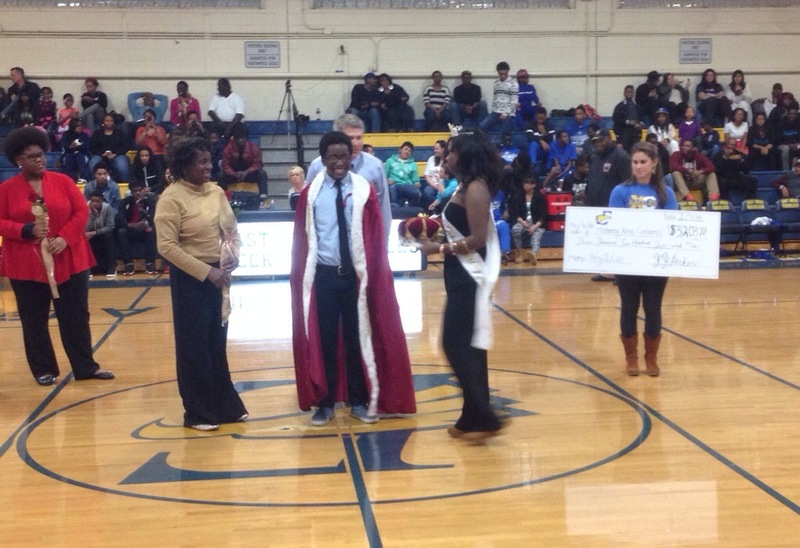 The student who raised the most money was crowned homecoming king. CHARLOTTE, N.C. — In what may very well be an historic first for the Queen City, a transgender student was crowned homecoming king Friday night at East Mecklenburg High School. 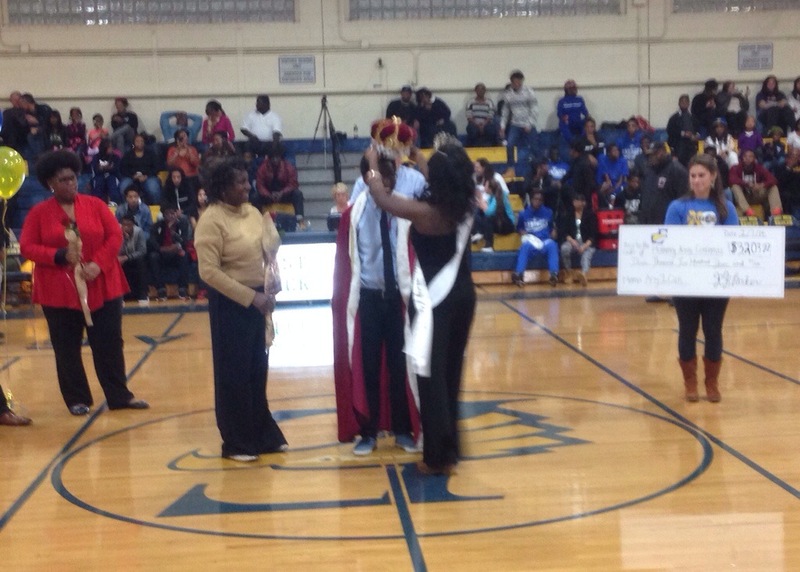 qnotes first brought you the story of 17-year-old East Meck senior Blake Brockington earlier this week, after he was nominated by his peers to run for homecoming king. In order to win, Brockington had to raise the most money for Mothering Across Continents, an international non-profit working to build schools in South Sudan. Brockington blew the competition away, raising $2,335.55 of a total $3,203.22. Some of the money flowed in from across the city and state, with local LGBT youth services agency Time Out Youth Center helping to collect the funds. “This means a lot to me because I know that for me this a dream that has finally been made and for others this is an inspiration,” Brockington said after the homecoming ceremony. Brockington’s foster parent, Donald Smith, said he has supported his foster son throughout the homecoming race. Bill Allen, an East Meck teacher and advisor for the school’s gay-straight alliance, says students and faculty at the school accept and honor diversity. Allen said past homecoming and other school events have included the welcomed participation of openly gay and lesbian students. Brockington, who is headed to the University of North Carolina-Charlotte next year to study mathematics, music and education, came out as transgender at the end of his sophomore year. At home, his step-mother was receptive, but his father rejected the notion. At school, Brockington faced taunts, mostly from other boys, as well as a lack of understanding and education from some teachers and, even, some guidance counselors. Teacher Martha Deiss, whom Brockington had for a civics and economics course his sophomore year, says he was one of her brightest students. Brockington, who now lives in foster care, says life at school and elsewhere has gotten better. He’s staying focused on class work and extracurricular activities. He plays rugby for a student club at the school and, when he turns 18, hopes to play for the Charlotte Royals, a local, LGBT-inclusive rugby team. Band, too, has kept him grounded, where he’s been a drum major for two years. Support from teachers like Deiss, his social worker, foster parents, and doctors and therapists have made all the difference. Next fall, he’ll attend the University of North Carolina-Charlotte where he intends to study mathematics with a minor in music and education. Earlier in the week, Brockington said winning the homecoming king title would be an opportunity to raise awareness. “I honestly feel like this is something I have to do,” Brockington said, noting few other transgender male students have had the opportunity. Last September, a Pennsylvania school district axed a transgender student’s attempt to run as homecoming king. In October, though, a transgender male student was elected at his Concord, N.H., school. Brockington said winning will mean the most for several younger transgender students he mentors, including a nine-year-old boy. Brockington’s win on Friday is believed to be the first time a transgender student has been elected homecoming king in Charlotte-Mecklenburg Schools. East Meck’s homecoming traditions are unique. In order to win homecoming titles, students must raise the most money for a non-profit. Additionally, East Meck has a “reverse homecoming,” with homecoming queen crowned at a fall football game and homecoming king crowned in a spring semester basketball game. Protesters shut down Uptown square, march down Tryon St.
1t has been a long road since the racial riots at East Mecklenburg High school in 1971. This millstone of a transgender Afro American being the home coming king has proven how generations can wash out bigotry and discrimination forty three years later.. Great job East Meck, Go Eagles. Heh-heh, just noticed your handle. I hope you’ve found your “Mel Pappas”, Jan. Battle on! What a truly AWESOME story! Congrats, Blake—and good luck in the future. You’re going to do great things, I’m certain!